Russian and Chinese forces exchanged experiences in combating terrorism. 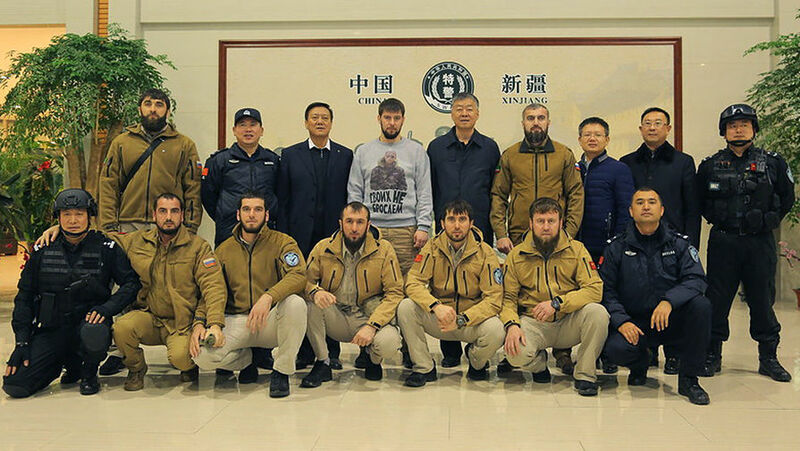 The Chinese will learn from Chechen instructors about how to deal with suicide bombers. To counter any possibilities of terrorist strikes, the head of the Chinese special forces wants them to train at the International Special Forces Training Centre, based in Gudermes, Daniil Martynov, Director of the centre, told Gazeta.ru. Martynov is also the head of the Chechen Republic’s assistant on cooperation with law enforcement agencies. He had just returned from the Xinjiang Uyghur Autonomous Region, where Russian and Chinese forces exchanged experiences in combating terrorism. “They have seen us at the international Special Forces competitions in Jordan, at the KASOTC Centre, and sought our cooperation,” said Martynov. The Russian team, prepared by instructors at the Chechen centre, was ranked first in the World Championships of Uniformed Special Forces held in Jordan last year. Participating in the combat competition were 43 teams from 19 countries, representing the best special forces from around the world, including from China, Iraq, the United States and Canada. The Chinese were the first to propose cooperation, said Martynov. In July, a delegation of the Chinese security forces flew to Grozny. The guests were shown videos on Chechen experiences in combating extremism and terrorism. The Chinese also visited the Terek Russian Special Police Forces Training Centre near the village of Tsentaroy, where they saw demonstrations presented by commandos. On the orders of Ramzan Kadyrov, a Russian delegation visited the Xinjiang Uygur Autonomous Region (XUAR) of China between December 6 and 10. It was headed by Daniil Martynov and Police Colonel Sharip Delimkhanov, Head of the Russian National Guard Forces in Chechnya. Xinjiang is the largest autonomous region of China, where most of the population are Uighurs, who adhere to the Islamic faith. A strong separatist sentiment has existed there over several decades, and attacks occur constantly, mostly with bladed weapons. “For us, this was a very interesting experience, because we mainly deal with explosives, for example suicide belts. At home, we have accumulated extensive experience and developed actual counter techniques, in particular in the field of identification of suicide bombers in a public place,” said Martynov. “The Chinese have also developed an effective system to counter the use of bladed weapons. This experience will be useful to us as well, our Chinese colleagues will teach their techniques to staff in our divisions, which are responsible for public safety,” said Martynov. Their visit, he said, was funded by the Russian National Guard. The delegation visited one of the largest training centres for Chinese Special Police Forces. The Chechen specialists witnessed Chinese demonstrations of wrestling, climbing and fire training. Chechen instructors showed their Chinese colleagues their own fire training skills. Martynov said the Chinese were ready to “start tomorrow”, but joint training would be possible only when all the necessary coordination work is completed by the RF Foreign Ministry, the Security Council and SCO. “This work is already underway, and once all authorizations are obtained, the Chinese are ready to come here the next day,” said Martynov. The delegation met representatives of the Chinese Communist Party in Xinjiang, the deputy chiefs of regional police departments and state security Ho Lyutszun and Chen Jun, deputy head of the Committee for Religious Affairs of Xinjiang Wang Chunfu, and Kadir Memet, deputy chief of the city police department of Urumqi. The Chinese centre is spread over an area of ​​over 100 hectares. Around 300 people are trained there every month, said Martynov. “The Chinese have good equipment for climbers and a high level of training. We also studied the various technical means used in the storming of buildings. For example, we especially noted the classrooms, where skills are developed virtually. Here they study terrorist attack situations using computer simulation,” explained Martynov. According to him, the Chechen centre will also be using a “cutting-edge multimedia simulator”, with panoramic screens and simulated light and sound effects, for the development of special forces operations. Russian instructors also learned how the Chinese use “police mini-stations” to maintain public safety, and how they protect police equipment, and the methods of detention and temporary holding of criminals, patrol techniques and personnel training. Members of the delegation also talked about the surveillance system used in Urumqi and how it works in sectors. According to Martynov, distances between the cameras are between 300 and 500 metres, while almost 75% of the cameras are located in natural areas with vegetation and bodies of water. Each police mini-station has communication resources and means to assist victims. The Chechen International Special Forces Training Centre in the town of Gudermes is not yet functioning at full capacity. Construction is likely to be complete in 2018. The town is spread over an area of ​​over 400 hectares, has its own airstrip and 40 facilities for practicing fighting against terrorists in urban areas. The centre will also have a wind tunnel, a testing ground for training in mine-explosives, and a parachuting complex. The International Special Forces Training Centre is a private-sector organization, and does not belong to any government agency. “The Centre educates civilians (athletes) in theory and practice. To train employees of law enforcement agencies, the centre has its own infrastructure – shooting ranges, a tactical village, a gun room, deep swimming pool, 3D-capabilities, video recording facilities, accommodation, cafeterias, gyms, and other related facilities. Special Forces training is conducted by instructors in isolation from other visitors,” a representative of the organization told Gazeta.ru. Ramzan Kadyrov, the head of Chechnya, initiated the building of this centre. In November, he said he was looking for foreign instructors, including “tough guys” from the United States. It has been clarified that they were not talking about current military personnel or US intelligence officials. The plan is to attract up to 200 specialists, and 10 private American instructors have already submitted their applications, said the Chechen leader, without mentioning specific names.